Let Grab simplify your daily commute! Just got off the MRT but can’t get to your office because it’s pouring? Waited for a feeder bus only to find that it’s packed? We’ve been there, the struggle is real alright! We know your daily commute can be taxing. It takes a lot of effort and time. So why add more frustrations to your day when you could just Grab the rest of the way? From 22 August – 2 September 2016, book a GrabCar to or from any MRT station on the North-South or North-East line to enjoy $5 off your next 5 GrabCar rides. Use promo code WHYWALK. But hurry, it’s limited to 5,000 rides daily. On the booking screen, select your pick-up and drop-off points. Do note that, in order to qualify for this promotion, your pick-up or drop-off points have to be an MRT station along the North-South or North-East line. For example, if you’d like to go to Bishan, please enter Bishan MRT as your drop-off point. Choose the GrabCar (Eco) vehicle type and choose your preferred payment method. Enter the promo code WHYWALK in the promo code field. Tap ‘Book’ and enjoy $5 off your ride. Upon successful booking, you’ll automatically receive a $5 discount off your fare. Campaign runs till 2 Sept 2016. Either pick-up or drop-off points have to be an eligible MRT station. Eligible MRT stations refer to those along the North-South or North-East line. Eligible for both new and existing users who book a GrabCar (Economy). Yes. Please use the promo code WHYWALK. 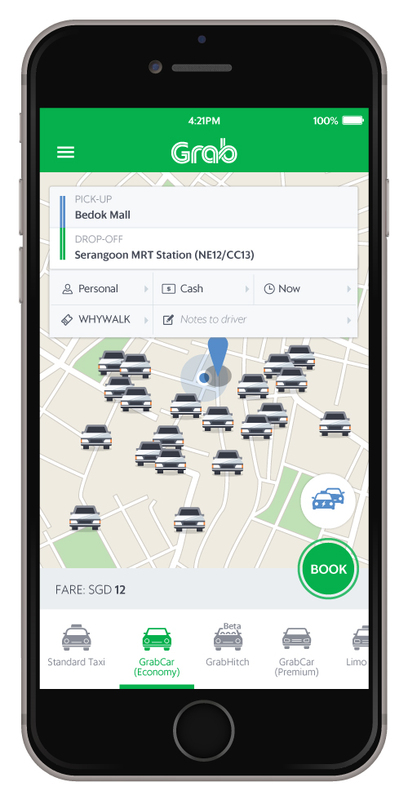 For the promo code to work, you need update your app to the latest version, choose the GrabCar (Eco) vehicle type, and ensure that either of your pick up or drop off points are MRT stations along the North-South or North-East line. Do note that you can only redeem this promo code during the campaign period. Both new and existing users are eligible for this promotion. If you are unsure of your eligibility, key in the promo code WHYWALK and check if it activates for you. If it works, you can participate in this promotion. On the main booking screen, please ensure that either your pick-up or drop-off locations are MRT stations along the North-South or North-East line. For example, the following pick-up or drop-off locations will get you your discounted ride. Jurong East MRT, Bukit Batok MRT, Bukit Gombak MRT, Choa Chu Kang MRT, Yew Tee MRT, Kranji MRT, Marsiling MRT, Woodlands MRT, Admiralty MRT, Sembawang MRT, Yishun MRT, Khatib MRT, Yio Chu Kang MRT, Ang Mo Kio MRT, Bishan MRT, Braddell MRT, Toa Payoh MRT, Novena MRT, Newton MRT, Orchard MRT, Somerset MRT, Dhoby Ghaut MRT, City Hall MRT, Raffles Place MRT, Marina Bay MRT, Marina South Pier MRT, Punggol MRT, Sengkang MRT, Buangkok MRT, Hougang MRT, Kovan MRT, Serangoon MRT, Woodleigh MRT, Potong Pasir MRT, Boon Keng MRT, Farrer Park MRT, Little India MRT, Clarke Quay MRT, Chinatown MRT, Outram Park MRT, HarbourFront MRT. “Hop of the MRT, Hop on Grab” (“the Campaign”) is organised by GrabCar Pte Ltd. (“the Organiser”) and is open to all GrabCar users. The campaign will run till 2 September 2016, GrabCar Pte Ltd reserves the sole and absolute right to alter or end the contest at any time, without giving prior notice or compensate in cash or in kind. GrabCar Pte Ltd shall not be responsible or liable for any claims of loss or damage to property or any personal injury or loss of life resulting from or related to this contest. Participants acknowledge and agree that GrabCar Pte Ltd reserves the rights to disqualify any entry if it is in breach of its obligations or any terms and conditions of this contest.